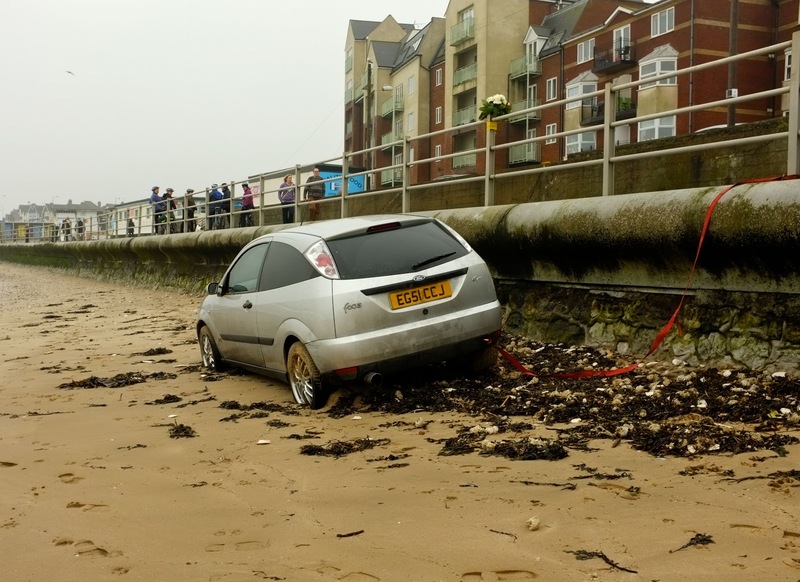 One desperate driver has been forced to go to extraordinary lengths to avoid the new scale of car parking charges introduced by Clive Hart's Labour administration but at St Mildred's Bay this morning, the results were somewhat unexpected. 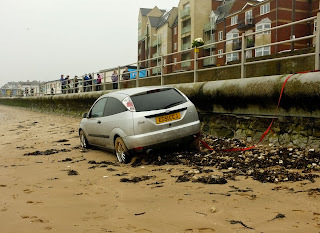 The story, as reported to me, was that a young man, possibly inspired by last weekend's beach racing on Margate sands, decided to take his girlfriend on a romantic beach detour, yesterday evening and then discovered that his Ford didn't have 4WD. As I write, the tide is still coming in and the recovery truck on the promenade, out of picture, is quite helpless. I used to see this quite often as a boy but mostly fisherman who were stuck, trying to launch or recover their boats. My friends and I would sit on the promenade and watch nature take its course as the vehicle slowly submerged on the incoming tide. Remaining with Westgate, I hear reports of a new campaign to 'Save' our library. This came as a surprise to both me and our county councillors and it transpires, this is all part of a new campaign to promote Labour's John Edwards ( presently a Dane Valley District Councillor) as a prospective county candidate in May against the sitting Conservative, Cllr Robert Burgess. Other than leafleting, it's reported that both John and Westgate's Jodie Hibbert, are presently living in a small tent and a cardboard box, outside the library, firmly resolved to keep it open, even though there are no plans to close it. There they are pledged to remain, until either the date of the election or it is 'Saved,' whichever comes first. One can normally tell there's an election of one kind or another close by, when Labour councillors start popping-up trying to save one thing or another. You may have noticed that the red-flag waving Broadstairs Leninists who publish 'Thanet Watch' are equally busy trying to save the QEQM hospital from being privatised and handed to Richard Branson's Virgin group to manage, which no doubt comes as a surprise to the hospital trust. The proposed Westgate Tesco Metro (F/TH/12/0769) is now coming before the Council's planning committee on 20th March at 7pm. This will take place at the Council chamber in Cecil Square and is open to the public. I have been asked by local traders and petitioners to speak against the application and so if you have any representations, please send them to me at my councillor address. Here's is a link to the latest plans if it works on your PC. Following my last blog entry on out-of-control dogs, I was sorry to have a message from a dog owner in Cliftonville who told me her chihuahua was attacked and killed by a 'staffie' in Palm Bay on Wednesday afternoon. Speaking with another lady at the pet shop yesterday, she agreed with me that one needs to have one's head on a swivel taking a small dog for a walk these days, which is possibly why dog-owners are now seen walking in large groups for mutual protection and assistance against the ever too frequent risk of out of control and aggressive animals on our beaches. As a final local note, I would like to extend a warm community welcome to the Reverend Barbara Way, who joined us at a ceremony at St Saviour's Church on Tuesday and mention that the tennis courts relining has been completed at St Mildred's bay and these are now available for public use again. Also, it's the monthly meeting of the WWRA at the Bakehouse in Westgate at 7pm on Monday evening. This week, I've been up at Sywell aerodrome in Northampton for the CAA's 2013 display pilot's symposium. One of the highlights, was a talk from Martin Withers, the chief Vulcan pilot and the only man to fly one in anger, during the Falklands War, bombing the runway at Port Stanley. With luck, we will be seeing Martin and the iconic bomber at the Manston airshow on the 20th June. It needs a small fortune to keep the aircraft flying and if any reader is feeling generous, here's a link to their campaign site. How ironic that a certain campaigning cllr left the Tories over parking charges and is now supporting Labour. Maybe he'll speak up against them at the next council meeting? Perhaps we could start a list of books for John Edwards and Jodie Hibbert to read. How about "Truth: A Guide for the Perplexed" by Simon Blackburn, or "Living a Lie" by Josephine Cox. I am sure there must be many more appropriate titles. Re Vulcan. Can I recommend "Vulcan 607" by Rowland White. The story of getting bombs onto the runway at Stanley Airport in the Falklands war. And now updated. I remember seeing 4 Vulcans at Farnborough in 1961 taking off in a simulated four minute warning. A fantastatic sight. The trouble with bull terriers is that training is not the same as with other breeds. A collie is bred to herd. It has collie eye which is a threat signal although the tendency to follow up threat is bred out. My labrador years ago had to be put on lead if border collies were in the park playing with kids. Because the collie eye threat signal would not be tolerated by the old labrador near kids. I was harassed riding a bike,for the labrador to chase, in the park early one morning. By a boxer and samoyed. The labrador tore into both of them and saw them off. The same with a dobermann whose owner had actually said "My dog is dangerous you better call your dog and put it on lead". I said "Your dog will be back to you soon enough". The dobermann went for labrador. A squeak or two and dobermann ran squealing in pain back to its macho owner. My lab was used by a vet school to train vet nurses. It was so amenable. But it was hard as nails if attacked. The bull terrier is bred for tenacity and fight. Its instincts are not a foundation to exploit instinct as a basis for training. But I suppose trophy dog owning types don't attend useful activity like that. Ah yes, the closure of public services line. I got a leaflet this morning talking about an apparent threat to the Six Bells Sure Start Centre. A new one on me. This tactic is so depressingly predictable. What I don't understand is that if all the alarmist claims get Labour into power, they are not bright enough to do anything constructive when they get there. What drives them, or are the miserable and derisory allowances and misplaced sense of importance so vital to their existence. The Labour party strategy is as follows: Lower standards in education. (Already done). From this, future generations will not be able to see through Labour misinformation and thus vote Labour into office. What will result is that the quality of future young candidates will think they know everything but actually know nothing. Hopefully Michael Gove will prevent this happening.